So last Monday we left our hotel in Durango and made the drive over to Mesa Verde National Park. We were a bit surprised to learn that the Park Service was letting people in for free that day, but then a bit disappointed to learn that it was because they were doing road construction and maintenance on some of the cliff dwellings (which were closed). From the park entrance, the main road is steep and twisty as it climbs up a few mountains. With some delays from road construction in the park, it took awhile to finally make it to the visitor center. But along the way we did stop at a few overlooks. 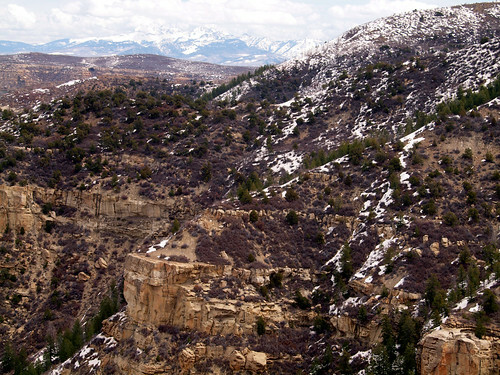 This is a view from the Geologic Overlook, of some snowy Rocky Mountains. We stopped and had a look around the visitor center, and then drove to the Chapin Mesa Museum. 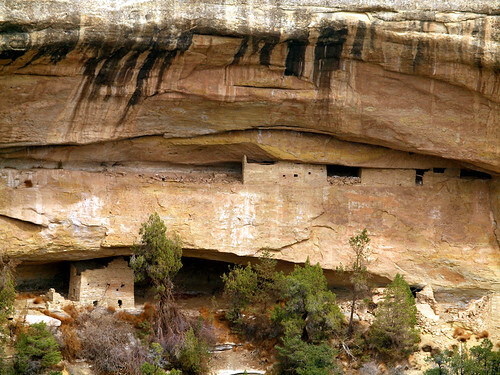 From the museum, you have a nice view of the Spruce Tree House cliff dwellings, which are usually open to the public via a self-guided tour. But that trail was closed for maintenance. I asked a ranger why, and he said they were re-paving the trails that day. It's much easier for them to close the entire trail down instead of leaving parts of it open, since people tended to ignore the "keep out" signs in order to trod over the wet concrete. 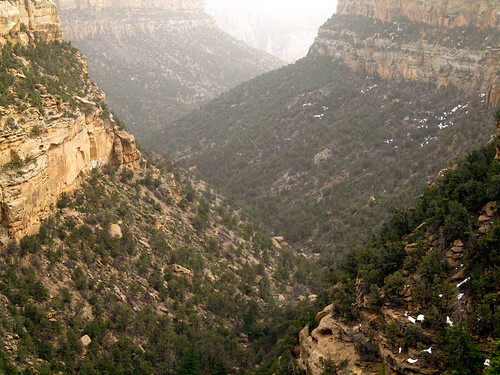 The park contains several steep valleys and peaks, with elevations ranging from 6,100 to 8,400 feet above sea level. 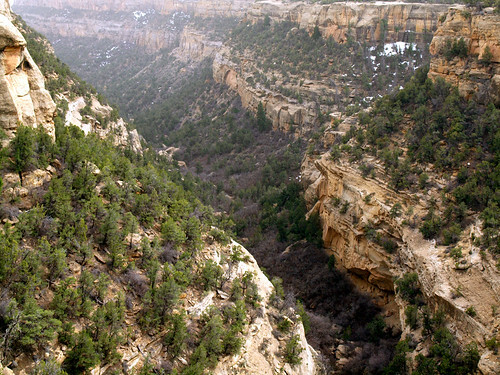 Mesa Verde became a National Park in 1906, in an effort to preserve the ancient cliff dwellings. Looting and vandalism had left their mark, so the government finally stepped in to protect it. And it's easy to see why it needed protecting. The cliff dwellings here are massive, and over 800 years old. 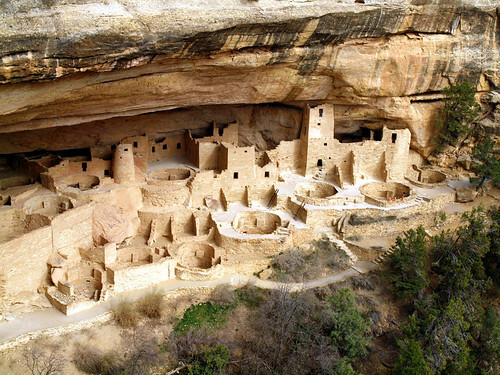 The cliff dwellings at Mesa Verde were built by the ancient Pueblo people known as the Anasazi, sometime around the 13th century. 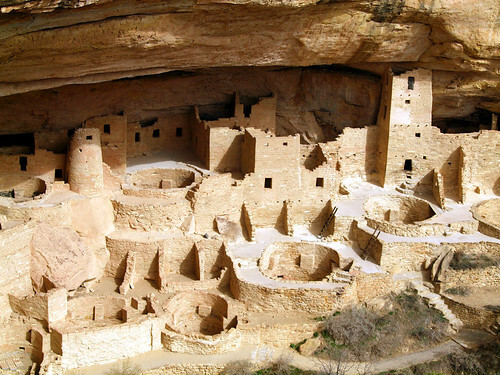 Mesa Verde contains a surprisingly large amount of ruins, several of which are small and are perched precariously on tall bluffs. 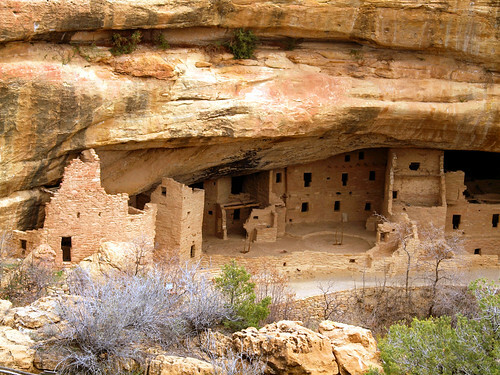 The larger cliff dwellings are like small cities, all constructed from blocks of sandstone that were held together with adobe mortar. 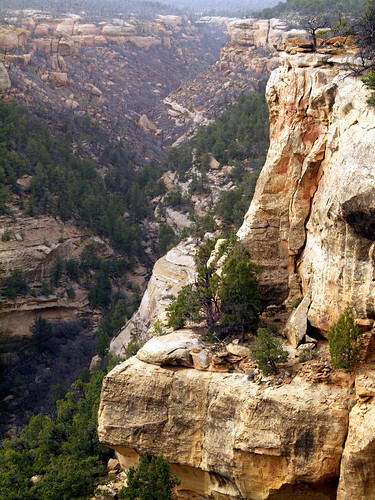 There are two loops in the park, with overlooks above many of the cliff dwellings. This is a view of the Square Tower house, which is the tallest dwelling in the park. It's thought to have been occupied between the years 1200 and 1300. 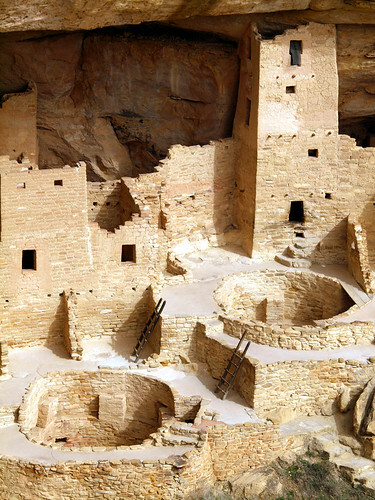 The Anasazi built and lived at Mesa Verde for about a century, but then mysteriously disappeared. No one knows for sure why they abandoned the area, but one of the main theories is because a series of droughts disrupted their crops. 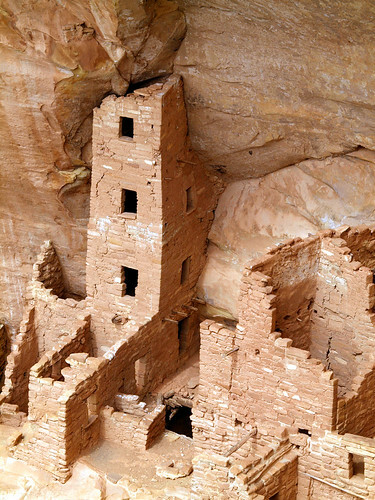 After the Anasazi left, it doesn't appear that anyone else even saw these ruins for centuries. 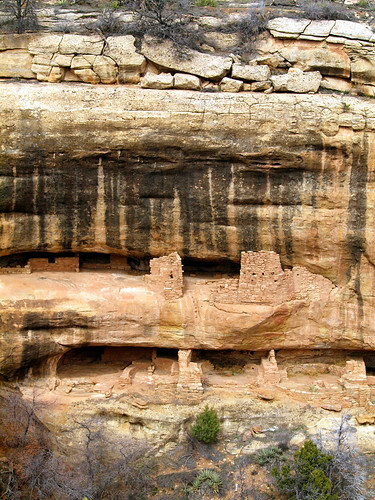 Spanish explorers went through the area in the 1760s and 1770s, but they didn't reach the cliff dwellings. They did name give the area its name, which is Spanish for "green table." News of the dwellings became known in 1873, when a prospector visited the area. 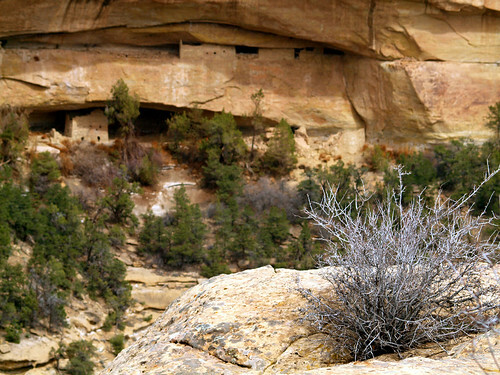 The next year, that same prospector led a photographer into the Mesa Verde area, and he made the first ever photos of the cliff dwellings. 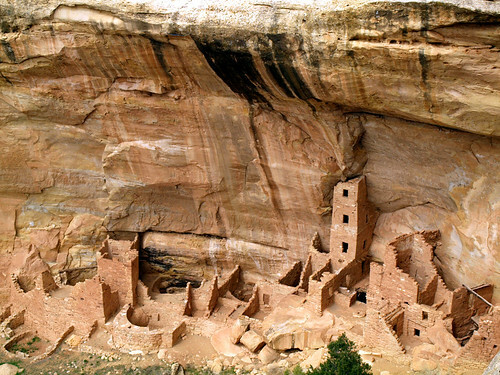 More and more ranchers started moving into the area, which led to vandalism and looting at the cliff dwellings. Ancient artifacts were removed, presumably sold on some sort of 1800s version of Ebay. But the souvenir seekers did some heavy damage to the old cliff dwellings. They knocked down walls, just to let in more light into some of the rooms. Ancient timbers that supported roofs were torn out for use as firewood. 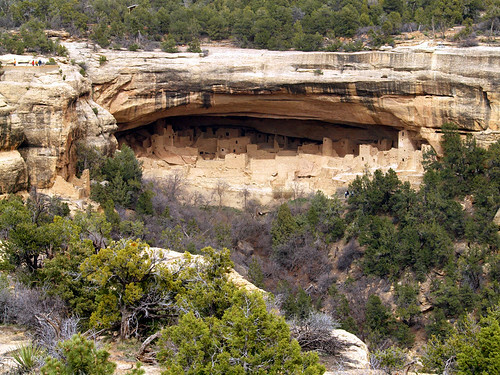 The man-made destruction, along with natural erosion, left the cliff dwellings in a bad state. 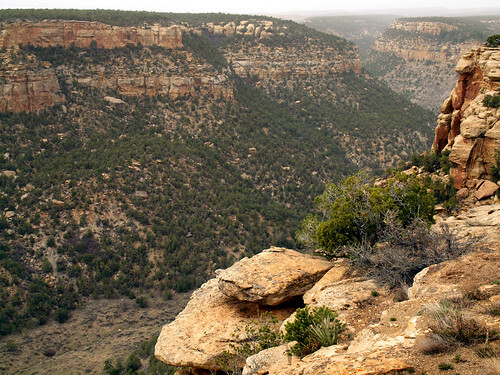 The concerns about damage to the area led to the creation of the National Park in 1906. These shots were taken from the Sun Point View overlook, which is an amazing spot. 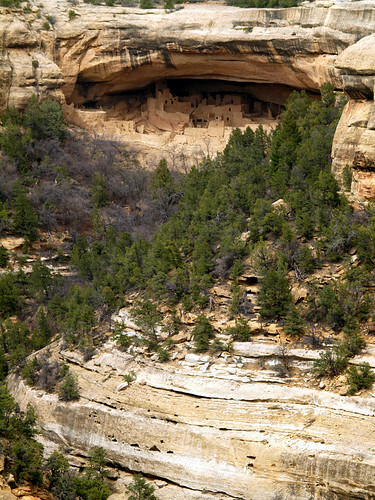 The overlook includes numerous cliff dwellings, including that of the Cliff Palace. But several smaller dwellings can be seen, situated quite carefully along the bluff and some alcoves. It's really amazing to consider that this was built 800 years ago, along the side of a sheer bluff. I can't even imagine how difficult that must have been. We headed on towards another overlook, this one of Cliff Palace. This was called Camera Point, so it seemed like a fitting spot to test out this new camera. The Fisher Price MarkD Rebel EOS Evolt E-30 is an amazing and compact camera. It has a high megapixel count, an enhanced digital sensor, and a fancy plastic flash that pops up when you hit the shutter. 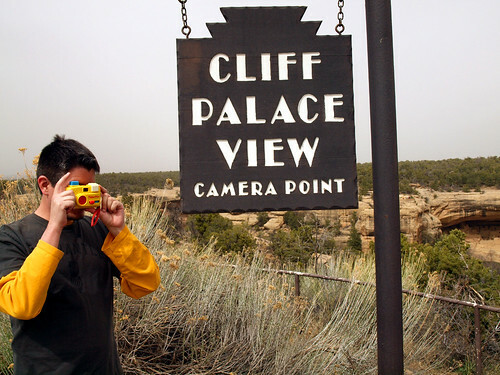 But here is a view of Cliff Palace from the Camera Point overlook. 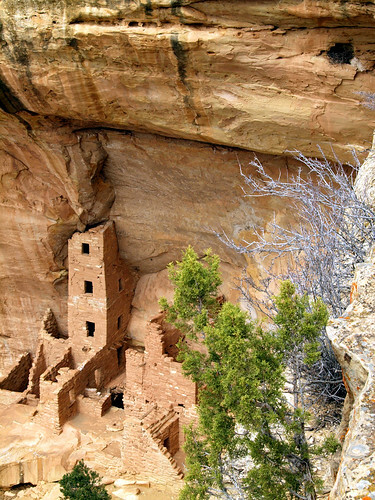 Cliff Palace is the most famous cliff dwelling in the park, and is thought to be the largest cliff dwelling in the world. Another view from this overlook was of some distant mountains. It was a bit hazy out there that day, thanks in part to some distant storms. We headed to yet another overlook, which provided closer views of Cliff Palace. For a comparison, this is a shot of Cliff Palace back in 1891. It shows what state the ruins were in before the Park Service did some restoration. And a closer view of Cliff Palace. 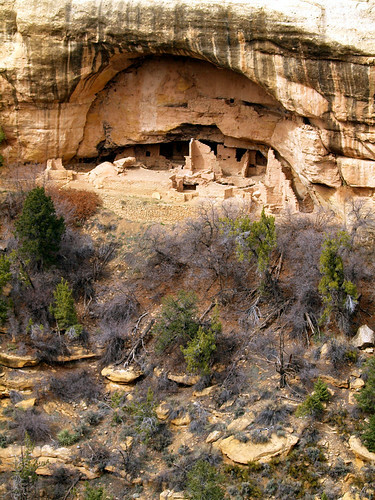 It's now thought that construction on this massive cliff dwelling started around 1190, and was occupied up until 1300. Awesome photos. Looks like you had a great trip. 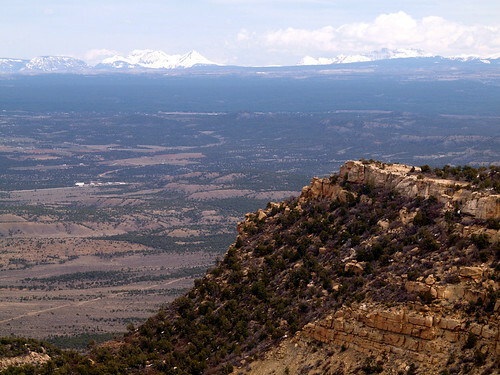 Mesa Verde has been on my list to visit for a long time. Thanks it was a great trip - and Mesa Verde really is a neat spot. There is so much to see there. Interesting place it's so perfect for your family vacation.